The Shiite militia run by anti-American cleric Muqtada al-Sadr seized total control of the southern Iraqi city of Amarah on Friday in one of the boldest acts of defiance yet by one of the country’s powerful, unofficial armies, witnesses and police said. Prime Minister Nouri al-Maliki dispatched an emergency security delegation that included the Minister of State for Security Affairs and top officials from the Interior and Defense ministries, Yassin Majid, the prime minister’s media adviser, told The Associated Press. The Mahdi Army fighters stormed three main police stations Friday morning, planting explosives that flattened the buildings, residents said. About 800 black-clad militiamen with Kalashnikov rifles and rocket-propelled grenade launchers were patrolling city streets in commandeered police vehicles, eyewitnesses said. Other fighters had set up roadblocks on routes into the city and sound trucks circulated telling residents to stay indoors. This event yesterday is the boldest action to date by an Iraqi militia. It demonstrates the impotency of the so-called government of Iraq. With very little effort, a militia working under the instructions of the radical Shiite cleric Muqtada al-Sadr was able to take control of this city of approximately 340,000 people in Eastern Iraq. His militia did so with apparent impunity. While later reports suggested the militia has withdrawn at the request of an envoy working for the Iraqi government, no doubt the point was understood inside the Green Zone: focused militias of sufficient size can control not just towns, but major cities, and the Iraqi Army is largely incapable of stopping them. Even the Bush Administration grudgingly admits that the security situation has simply spun out of its control. The result is a toxic mixture of anarchy and civil war. The influential cleric Muqtada al-Sadr understands that Iraq really is no more. That is not to say the “government” of Iraq is wholly impotent. However, from a tactical level it is just another militia. Since it is backed by the United States, it is one of the more powerful ones. Yet even with the powerful assistance of tens of thousands of American troops in Baghdad alone and aggressive block-by-block efforts to clear neighborhoods of arms and insurgents, the violence has intensified. The carnage is clear from many statistics: deaths of American soldiers in Iraq are reaching a two-year high, there are an average of 100 Iraqis murdered on a typical day, the ethnic cleansing of whole neighborhoods continues largely unchecked, and 914,000 Iraqis that have relocated since the war began. Al Sadr’s militia will be one of many already trying to establish dominance over various regions of Iraq. For now, the conflicts are mostly between Sunni and Shiite militias. In Baghdad, the sectarian war seems to be one without clear boundaries. Yet competing militias are still working within the city to control territory, despite the heavy presence of Iraqi and American troops. The Iraqi Army and Police have proven to be mostly useless there, and some elements inside it are working for sectarian interests. North of Baghdad we recently read about Sunni militias killing more than 100 Shiite residents of the city of Balad. In Western Iraq, our military admits it cannot improve the political or social situation there, and its ability to control territory is very limited. Here in the United States the average voter now understands that Iraq is embroiled in a civil war, and it has spun out of our ability to control it. Nevertheless, we are still largely in denial that the state of Iraq has ceased to exist. We think that because it has a parliament, it is a state in fact. For a state to be one in fact, and not just in name, it must control its territory. Paramilitary groups control much of Columbia, and consequently those areas are really no longer a part of Columbia until the Columbian government can control them. Aside from the Green Zone and scattered neighborhoods and cities, government forces do not control Iraq either. In fact, the Green Zone is starting to eerily resemble Hitler’s bunker at the end of World War Two. That few of those who control Iraq will venture outside the safety of the Green Zone speaks volumes. Today’s reality is that Iraq is stateless. It is rife with competing militias each attempting to gain the upper hand. Who controls a given territory largely depends on which force or militia has dominance over an area at a given time. With no clear boundaries, increasingly Iraqis are choosing to relocate to be with their own clans. A de-facto partitioning of Iraq has been underway for some time. People are expressing the reality with their feet. Those who can, such as the oppressed Christian community, are emigrating and ending up in nearby states like Syria. At the White House, the disconnect between the reality in Iraq and official policy continues to become more surreal and now has entered the realm of the bizarre. An Iraq Studies Group has returned from Iraq. Headed by Bush’s father’s well-respected Secretary of State James Baker and former congressional representative Lee Hamilton of Indiana (who also vice chaired the 9-11 commission) the group is reportedly putting together a list of recommendations to deal with the Iraq mess. While its conclusions are unknown, Bush stated just yesterday that he is only amenable to changing tactics, not strategy. He still operates under the illusion that Iraq can be a free, democratic and contiguous state. His inability to acknowledge reality is doubtless fueling the animus that suggests that voters will allow Democrats to retake the House of Representatives in November, and possibly the Senate as well. “If wishes were horses, beggars would ride.” Just as Humpty Dumpty could never be put back together, there is no way to put Iraq back together either. At this point, it is beyond even Saddam Hussein’s ability to reform the Iraqi state. The Iraqi civil war is well underway. Clerics like al-Sadr are making their own reality. They are forging the sad new turbulent reality that was the country of Iraq. There remains some small sliver of hope that Iraq will balkanize into a federation of states. Bush should be embracing this outcome. While it remains highly dubious, it still exists within the realm of the possible. The free, prosperous and democratic Iraq he envisions was always just a neoconservative fantasy. If a federalist state emerges, it will not last long. Its purpose will be to give us an excuse to withdraw our forces, and then it will collapse. I do not think federalism will take root in Iraq. Instead, I see continued civil war with the eventual creation of loose Sunni and Shiite states, and a stronger Kurdish state to the north. Within each state, there will be considerable bloodshed as competing militias fight for control. The real fight, of course, will be for whom controls access to the oil resources. It remains to be seen whether the sectarian violence in Iraq will spill over outside its borders. 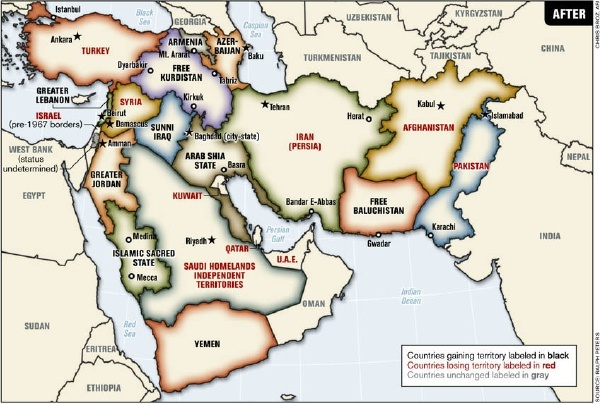 When all the bloodshed finally ends, will this be the new map of the Middle East? very, very far-fetched. this seems more like something of an american dream than a reality. let’s start with the fertile crescent. under what circumstances would syria accept a landlocked nation? you present no explanation for the status of the gaza strip? will it be united with the West Bank? annexed to Egypt? and what about Jordan, who will benefit from their enormous land-grab of northern Saudi Arabia? let’s move on to the gulf. an Arab Shia State taking all that land from Iran? Under whose instructions exactly? and Iran will end up with 1/8 of the “persian” gulf’s coast? will it finally put an end to the arab-persian name war when 90% of the coast is arab? and how will sunni-ruled shia-majority kuwait survive surrounded completely by a Shia State? i guess my main question is HOW and WHY? the Americans are losing their support and power in the region and not gaining it, so who will bring about all these changes?